Caledonian Snooker Ltd is the only governing body in Scotland for Snooker & Billiards. Caledonian Snooker is the company name however the brand name is Scottish Snooker, we are known as Scottish Snooker and our logo reflects this. This decision was made in consultation and following advice from Jim Alexander of Sports Scotland and also Companies house during the formation of the company in 2010. Caledonian Snooker Ltd (CSL) was formed in March 2010 during the demise of the previous SGB, Scottish Snooker Ltd. Conditional accreditation was granted by Sportscotland in June 2011. We have successfully passed the pre application stage with Sportscotland. Membership figures have varied over the years. In the season 2014/15 we have 149 individual members and now 5 of 10 leagues affiliated. The organisation is managed by a board of up to 7 directors elected by the membership, and a management team appointed by the board to look after the day to day business. The board aim to develop the game and the organisation, while trying to consolidate / increase the existing membership and events programme. There are 9 local snooker leagues/associations (LAs), which organise various team and individual tournaments. These events are invariably played on midweek evenings and provide a competitive social evening for the players. The total membership of the LAs is approximately 900 players. Of the 9 listed above we currently have 5 already affiliated and are in discussions with the others. Dumfries and District Snooker League (60), Dumfries & Galloway Seniors Snooker Association (65), Aberdeen Licensed Clubs Billiards & Snooker Association (170), Edinburgh Inter Club Association (261) and the Falkirk League (28) are all affiliated to us. Therefore, we currently have 67% of league membership affiliated. Of our full members if we subtract anyone from these areas – not even necessarily playing in the league – this leaves 121 individual members not potentially in an affiliated league, added to the 584 affiliated equates to 705 from a possible 956 who play any competitive snooker in Scotland, 73.7%. All of the LAs have different structures/constitutions and operating criteria but are well organised with committee governance. Some of the NGB individual membership ( 149 members) also plays within an LA. The HIBSF represents Scotland, England, Wales, Northern Ireland and The Republic of Ireland and promotes the annual Home International Series for teams of Men, Ladies, Under 21s, Under 16s and Billiards. Caledonian Snooker Ltd won the Ladies event in 2010 while our Under 16s won their title in 2011. Scotland has enjoyed many previous successes in these events. The EBSA represents 34 European NGBs and promotes two multiple events every year. In March we participate in the European Under 21 Championships for individual players, and the Men’s, Ladies and Masters Team Championships. In 2012, Michael Leslie brought the Under 21 title home to Scotland. In June we also participate in the Men’s, Ladies and Masters (over 40s) championships for individual players. In 2012 Scott Donaldson won the men’s event to make it a European double for Scotland. The IBSF comprise 5 Regional Federations, Africa, Asia, Europe, Americas and Oceania with a total membership of 86 NGBs. The IBSF promotes 3 multiple events annually. In July we participate in the World Under 21 Championships for individual players. Scotland had 1 previous success in the 1990s. In November we are involved with the World Men’s, Ladies, and Masters Championships for individual players. Scotland had 1 previous success in the 1990s. Professional snooker status is controlled by The World Professional Billiards and Snooker Association (WPBSA): The WPBSA is a private limited company owned and controlled by professional snooker players. The WPBSA operates as both the professional governing body of the two cue sports, alongside its amateur counterpart, the International Billiards and Snooker Federation (IBSF), The organisation determines the rules and regulations of snooker, including disciplinary matters. World Snooker runs a “Q School” once a year in May where 2 qualifying tournaments are run over 10 days so that 8 players can qualify for the professional tour the following season.The cost for each player to enter Q School is £600 plus all their expenses for their stay at the qualifying venue. a) The European Under 21 Championship. b) The European Men’s Championship. c) The IBSF World Under 21 Championship. d) The IBSF World Men’s Championship. There is no direct affiliation link between amateur and professional snooker, nor is there any direct financial support from the WPBSA to grass roots level other than one place at q school to each NGB. This is however reviewed on an annual basis by WPSBA. It is worthy of note that 11 out of 20 years the World Championships has been won by a Scottish Professional. To run a successful NGB and for it to develop and grow requires funding plus the input of volunteers, Caledonian Snooker Ltd is no exception our development plan will only do this by an increase in volunteers and funding. Our membership alone funds tournament prize money and we have managed to turn out some International winners since our incorporation. We have a document as an attachment to our application from some of the players who have worked with us over the years and have since become professional players endorsing Scottish Snooker. We have created an NGB from a standing start with no inherited assets, government funding or sponsorship. Demonstrate that we can put in place a fully integrated pathway for all participants in billiards and snooker and not solely those players wishing to turn professional. Some snooker clubs have teams playing in the various local leagues. The local leagues provide weekly tournaments for teams and individuals. From there the best players gravitate towards the national ranking events that we produce, which determine international team qualification at all levels, and also provide entry to professional qualification events. We believe this condition is addressed via the development section on Performance (Page 20) and also via the Pathways document –Appendix A (P24) both of these areas will be updated as required, we are currently researching, holding talks with relevant parties and ensuring an action plan is in place before we embark on a schools initiative, obviously this would require to be added to the plan in the future. A membership development plan formulated with progress demonstrated towards a minimum affiliation of 500 by July 2014. Historically Scottish Snooker has never had individual membership levels as high as 500. As at May 2015 we have an individual membership of 149. We have agreed with Sportscotland that League Associations could be affiliated and their membership numbers included in our statistics. At our AGM on October 2013 a resolution was obtained in order to facilitate this. As mentioned earlier, 9 local organisations have already formed around the facilities available. We should work with them to integrate their activities into the National structure, by providing services and events of which all of them can take advantage. In this way we can introduce them to each other through competition designed for them only and thus promoting the NGB and our opportunities to a wider audience. We believe this condition is addressed via the development section on League Affiliations, Development Structure including coaching scheme,Development of Referees and Officials, Performance and also via the Pathways document –Appendix A (P24). A coaching programme has been organised for this season, actually in the next few months. We aim to have a minimum of 12 foundation community coaches in place very soon; coaches will be from affiliated leagues and our full membership. Costs of this initiative are being fully met by Scottish Snooker at this point. All policies are already written up on the website. The website has undergone an overhaul and a new website created and is available with all relevant documents published, www.scottishsnooker.com which has links with other bodies we are affiliated with. ( this is able to be viewed at this time and all policies are accessible). We will also use our Facebook page for publicity and to ensure all members are aware of all documentation and communication methods. Caledonian Snooker Ltd needs the full recognition from Sportscotland to enable us to continue to promote and develop our NGB and the sport. To retain at least 150 full memberships and try to increase individual membership year on year. To maintain or improve on a minimum of 700 members, increase number of affiliated leagues. To consult with the membership regarding 2014-15 and therefore maintain a system for members and a fee structure acceptable to the members. To retain at least 150 full memberships and try to increase individual membership year on year. To increase participation each year by full active members To restructure the fees applicable for both membership and per tournament to encourage more active participation in competitions in consultation with the players committee. To develop the number of junior members via coaching and other developments within this plan. To retain / improve on number of competitors in tournaments via consultation with players committee and actively trying to promote tournaments via website and social media methods alongside calendars in clubs around the country. To ensure we actively promote the Pathways document via clubs, coaches and schools. To continue to actively promote events and seek greater participation at events at all levels. 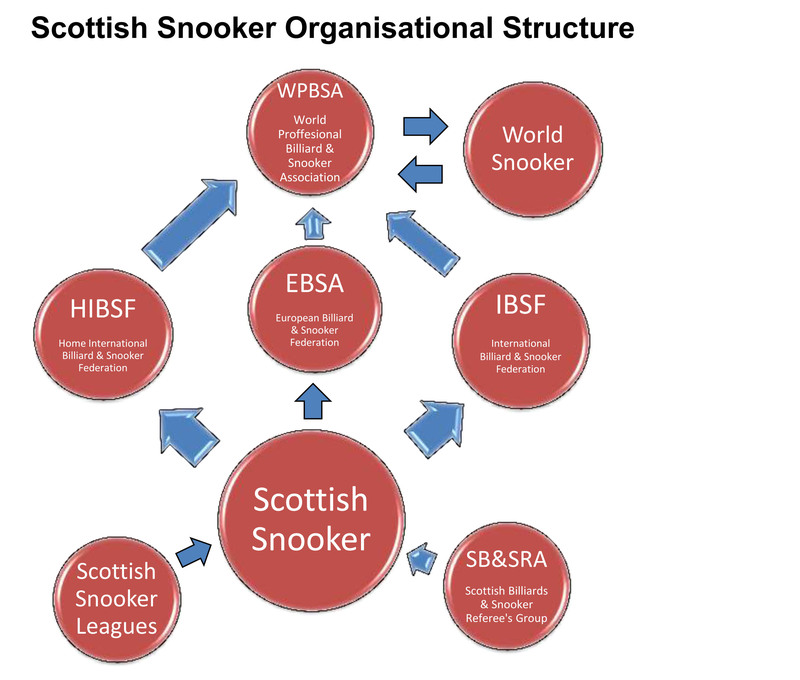 To increase League Association affiliations each year by at least one more association To ensure a minimum of 3 league associations have affiliated membership with Scottish Snooker To ensure a minimum of 7 associations are signed up for affiliation. To ensure a minimum of 9 associations are signed up for affiliation. To implement changes required to further embed our partnership with league associations and facilitate a regional development plan. To maintain a minimum of 9 associations are signed up for affiliation and if possible have all leagues operating in Scotland affiliated with us. Approach World Snooker and cost the delivery of the programme and investigate any other options available. To consult with the membership and seek out volunteers interested and committed to this opportunity. Obtain Sportscotland support for Community Coaches if we are to incorporate the WPBSA certificated course. Establish at least 5 areas in Scotland supported by LA Groups and community coaches. To have at least 12 foundation community coaches in place across the country. Continue to research the possibility of WPBSA Coaching courses for foundation community coaches if they are to progress – coaches continued professional development. Establish 6 areas supported by LA Groups and community coaches. System to be investigated re helping coaches to stay in touch together and access materials required. Establish 7 areas supported by LA Groups and community coaches. To maintain at least the 12 coaches in place and develop their numbers as is appropriate to both members, players and regional needs. Development Project to establish a strong snooker presence in all areas of Scotland and specifically target new young players Discuss ideas and develop a plan to tackle this. National Snooker Day – specifically targeting young players, under 16. Other groups still able to participate. To be held after National Finals – May/June. Financial Support will be required from Sportscotland re cues etc, we will research the most appropriate method of application. Develop this project to have a regional coaching programme in place this will help improve and develop this event – more young people take part. National Snooker Day becomes embedded in the snooker calendar as an annual event. To provide resources for club development – part of Snooker Community Coaches role Production of “How to start a snooker coaching club” pack. Ensure Child Protection Training for all Coaches. To investigate if PVG applications require to be made to authorities for all coaches, although parental / carer responsibilities for supervision remain during all activities / events. Maintain number of coaches required, as league affiliations increase – aim to produce more coaches and or have others in place in the relative areas. Maintain Child Protection training and PVG certifications are up to date as required / appropriate. Maintain number of coaches required, as league affiliations increase – aim to produce more coaches and or have others in place in the relative areas. Maintain Child Protection training and PVG certifications are up to date as required / appropriate. Plan a way forward to develop and embed good practice and communication regarding referees in Snooker within Scotland – Referees Association. All Scottish Snooker events to have a qualified referee in attendance as far as possible. To discuss regular seminars with SB&SRA for the training of new referees in conjunction with the needs and number of events in Scottish Snooker. Dates to be set if poss and incorporated into Scottish Snooker Calendar re training and advertised to all members and the public. Quality assurance systems to be in place to ensure a quality service and address any training needs met. Discussion with SB&SRA re this. Any gradings of referees are discussed with Scottish Snooker to ensure compliance with criteria. To review and evaluate new systems in place 2015/16. To develop any changes required as a result of this evaluation and implement system during this season. To continue to review systems and communication / training needs. To ensure quality assurance continues and to continue to develop this partnership. League levels. Referees association office bearers to meet with liaison officer and Scottish Snooker to ensure the way forward is agreed and planned for in full to ensure the needs of Snooker in Scotland regarding refereeing is met at all levels and that all stakeholders needs are addressed. To review the process and ensure continues to meet the needs of all. To review the process and ensure continues to meet the needs of all. Recruitment & Training of volunteer officials to operate as tournament directors To ensure a junior tour tournament director is appointed and trained / supported effectively. To continue to engage with other areas in Scotland and encourage clubs to participate in qualifying events and to provide a volunteer tournament director – training, support & monitoring will be required. To continue to engage with membership / club owners or other interested volunteers to become tournament directors. Training, support & monitoring will be required. To continue to engage with membership / club owners or other interested volunteers to become tournament directors. Training, support & monitoring will be required. To continue to engage with membership / club owners or other interested volunteers to become tournament directors. Training, support & monitoring will be required. 10 Local Leagues/Associations are formed around the available facilities by players who have the need to play competitive snooker at local level and 875 of them choose to do so. These LAs are well spread from Aberdeen to the Borders. From those LA members come some of the NGB players who wish to play competitively at National level. Those players may or may not have aspirations to play at international level or professional level but the opportunities will be available. Our organisation is not geared to cater only for aspiring pro players. We aim to provide opportunities for all players regardless of their level of ability, gender, race, disability or learning need to make progress in the sport. To maintain a representation at all levels and teams available at National, European and World levels. To ensure a representation at all levels and teams available at National, European and World levels. Members will be invited to participate in all competitions subject to their relevant placing in the rankings at that level and personal commitments / availability. To ensure a representation at all levels and teams available at National, European and World levels. Members will be invited to participate in all competitions subject to their relevant placing in the rankings at that level and personal commitments / availability. To ensure a pathways for performance improvement document is developed, in place and information disseminated to all members and affiliated leagues. A pathways for performance document is produced and disseminated to all stakeholders. Pathways for performance flowchart produced for ease of reference for all stakeholders and published for all to access. Pathways for performance documents regularly reviewed and revised as is relevant. Continue to update information and ensure it is available / published for ease of reference. Pathways for performance documents regularly reviewed and revised as is relevant. Continue to update information and ensure it is available / published for ease of reference. We are further developing our Policy Framework, and will continue to develop and monitor this. Child protection policy requirements Child Protection Policy published – web site & Facebook / social media, therefore accessible to all applicable parties. 100% adherence to the policy. Ensure officials receive training required. 100% adherence to the policy. Ensure officials receive training required. Equality Standards Policy published / accessible to all. 100% adherence to the policy. 100% adherence to the policy. 100% adherence to the policy. Complaints, Conflicts of Interest & Anti doping procedures clear and publicised Procedures and statements evident in the articles of the company and adhered to. Complaints procedures are also displayed clearly in the membership pack. To continue to maintain our protocols/ procedures as required and governed by these articles. To publish the information regarding these procedures on the website and investigate if it can be accessible via facebook page To continue to maintain our protocols / procedures as required and governed by these articles. To continue to maintain our protocols / procedures as required and governed by these articles. Increase income from membership Reduction in membership fees and tournament entry fees with a view to increase participants. Seeded players after consultation with the players committee however pay more for main tour events. Develop membership packages. Under18, full adult – both £10 only. Over 65’s free membership and also league affiliated members. Meet increased membership target over the next 4 years Maintain or increase membership income. Maintain or increase membership income. Continue to investigate / deliver a programme of regular income generation activities from sponsors, other funding opportunities and activities. New website to be operational and meet needs – ready for season starting in September 2015. Upgrade website adding in club / league information / contact points for beginners – snooker clubs near you. Maintain a high level of service and information to members and also the general public. Maintain a high level of service and information to members and also the general public. What do participants need? Access to venues. Access to suitable equipment.Access to coaches. Regular coaching and personal skills development. Local, Regional and National tournaments. National squad selection. Learning to play – rules and technique Practise sessions with coaches. National, European & International Competitions. Scottish Snooker will advise all clubs of the Tournament Calendar, website and Facebook page with promotion material supplied. Club Owners will also be advised where to find the Foundation Community Coaches for their area and contact details for them so that they can point any interested people in that direction if there is not a coach in their club. They will also be able to direct them towards the website / Facebook page where further details can be found. Club Owners are also able to contact Scottish Snooker if they require any further information or help. We have a very good relationship with many clubs and aim to continue to increase the number of clubs we use as tournament venues and continue to look for other interested and viable clubs to continue to grow and develop the game and increase the area of regional qualifying events whilst maintaining the element of competition and high standards required and also adhering to our own fairness and equality guidelines.